Jackson train ride: You can ride the St. Louis Iron Mountain and Southern Railway in Jackson, Mo. at the intersection of Hwy. 61 and 25. Most trains leave at 1 p.m. and the ride lasts 2 hours. Click here for their complete schedule. You can ride in the one of the vintage 1925 coach cars or the 1950 streamliner. There is much history in this ride with stories of Jesse James and Missouri history tales. There are also special days such as Dr. Seuss day, chocolate day, and others. The train runs from April through December. See pics here. . There are special group rates available. Dinner trains and Murder Mystery rides cost extra. Mud Island-Memphis: If you live in Southeast Missouri, you understand how much the Mississippi River has impacted our area from the beginning of time. Most of the larger cities were built close to the river, and there is much history there. At Mud Island in Memphis, you can take the riverwalk through an exact replica of the Mississippi River. You can read many interesting facts about the river and its course through America. There are many other things to do at Mud Island. You can ride the monotrain, ride the pedal boats, and visit the Mississippi River Museum, which is probably my favorite thing! They also have lots of events and concerts at the amphitheater there. Check it out at 125 N. Front St. in Memphis; you won't be disappointed. War Re-enactments: I don't know if this is a common thing in other states, but there are LOTS of war re-enactments in our area and across the state. Missouri was right in the thick of things during the Civil War, so its great to see what was happening here during that time. You can check out activities across the state, but I recommend going to a local one if possible. We experienced one near the St. Francis River a few years ago complete with cannons, period attire, and booths to buy things. It was very loud, but a great experience! If you read Part I of this post, I mentioned a couple of places that had re-enactments, the Hunter Dawson Mansion and Fort D. Prices Vary. Hemingway-Pfeiffer Museum: The Hemminway-Pfeiffer Museum is actually located in Piggott, AR. which is only a few miles from the bootheel of Missouri. You can tour the 1930's historic Pfeiffer home, and the barn used by Hemingway to write when he visited Piggott. Admission is only $5, and there is much history to be discovered. You can also sign up for one of their writer's workshops while you're there. The museum is located at 1021 W. Cherry S.t in Piggott. You really can't attend these places without learning something. 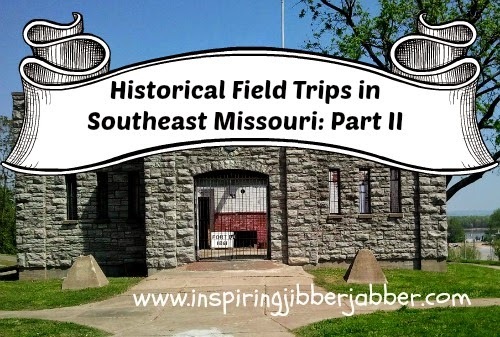 For a true field trip, do some research before the trip and take some notes. There are lots of possibilities for working these into your curriculum. Have fun! Check out Part I of this series here! Wow! There are a lot of great places to visit in the South east!